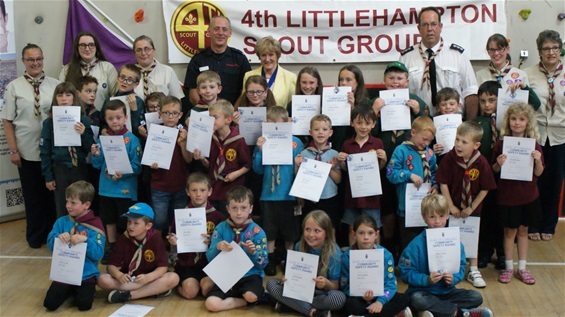 4th Littlehampton Beavers and Cubs became the first scout members in Sussex to achieve the Duke of Cornwall Community Resilience Award. The scheme teaches young people how to protect themselves, their families, and vulnerable people in their communities in an emergency situation. The 4th Littlehampton group (led by Group Scout Leader Martin Funnell) have been learning what to do in times of flooding or weather disruption for example, and have been working closely with Chris Scott from West Sussex County Council (WSCC) Resilience & Emergencies team. Mrs Pat Arculus, WSCC Chair, was full of praise for the scheme, calling it 'absolutely wonderful'. "It pulls families and communities together and gives these children skills and knowledge that they will take through with them to adulthood" said Pat.